Nine-time MotoGP world champion Valentino Rossi isn't very happy with the series' reigning title holder Marc Marquez. And quite truthfully, neither should the worldwide base of MotoGP fans who tune in to watch their favorite riders risk their lives in the quest for two-wheeled glory. 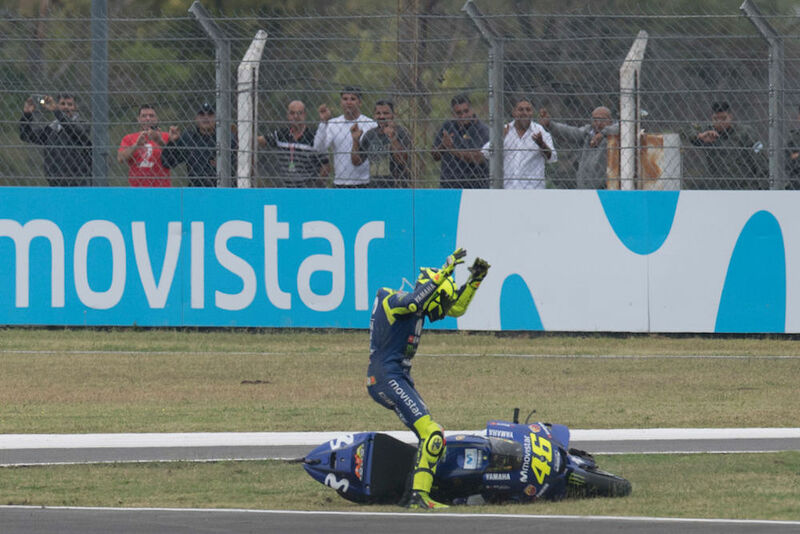 The feisty duo has enjoyed its fair share of drama on and off the track in previous years, but the shenanigans that took place on Sunday's MotoGP Grand Prix of Argentina took their rivalry to a whole different level in terms of severity and outright danger. Honda Repsol's Marc Marquez has always enjoyed a certain level of popularity for his flamboyant riding style that often includes lifting the rear tire under hard breaking, sliding the rear end, and basically hanging on for dear life as his Honda dives into corners with immense speed. But, there's another characteristic that plagues Marquez since his days in Moto2, and that's his wildly aggressive passing maneuvers that, more often than not, result in someone crashing. Such was the case in Argentina, where Marquez demonstrated this behavior as he frantically tried to make his way to the front of the grid following a drive-through penalty for disobeying the restarting procedure. Marquez caught up to Aleix Espargaro after several laps, only to viciously push him out of the way by shoving the front end of his Honda between the curve and Espargaro's Aprilia, forcing him off the track. Following the nasty little stunt, Marquez caught up to the first of the Yamaha factory riders, Maverick Vinales, who didn't have much to offer so he quickly surrendered the position. Much to no one's surprise, Valentino Rossi didn't roll over and play dead for Marquez, but that only made the Spaniard see red. As this tweet shows, Marquez quickly dive-bombed the Italian and pushed him out of the way much like he did Esparagaro. Unfortunately, this caused Rossi to lose control of his bike and crash. He was able to eventually rejoin the race, but the damage had been done. 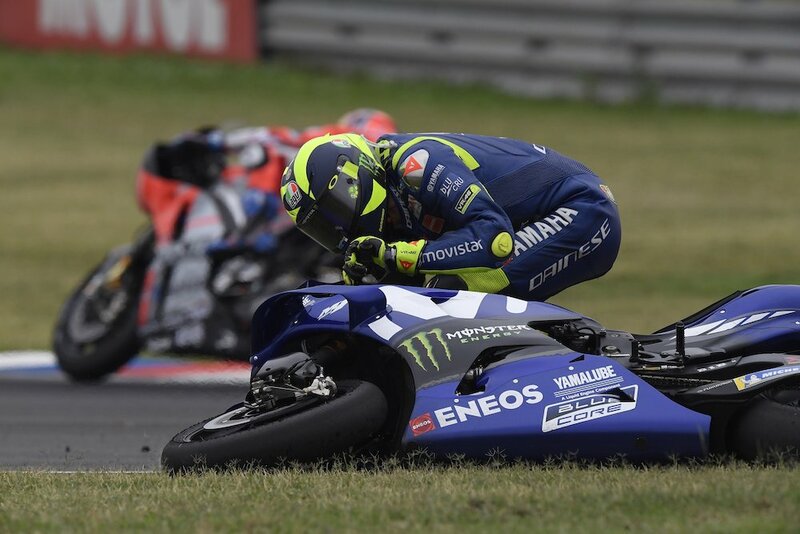 "I'm OK, but this is a very bad situation," said Rossi. "If you take what happened this weekend as an example, one incident can happen to anybody, you can make a mistake in braking, you can touch the other guy. It can happen, it's racing. But from Friday morning on, Marquez did this to Viñales, to Dovizioso, to me, and on Saturday morning, and today he went straight through four riders. If you start to race like this, you raise the level to a very dangerous point. If all the riders race like this, this will become a very dangerous sport and it will finish in a bad way. It's a very dangerous situation and I hope that what I said to Race Director Mike Webb makes them take more responsibility, they have to do something." "I'm scared on the track when I'm with Marquez," added Rossi. “I was scared today when I saw his name on the board. I'm not Race Direction—they will decide—but like this, he is destroying our sport, because when you do 300 kilometers per hour on the track, you have to have respect for your rivals." Tough words from one of the most successful riders in the history of the sport, about another one of the most successful riders in the history of the sport. In the end, it's up to the governing body to mitigate the elevated risks that Marquez is putting his peers under. Hopefully, before it's too late. 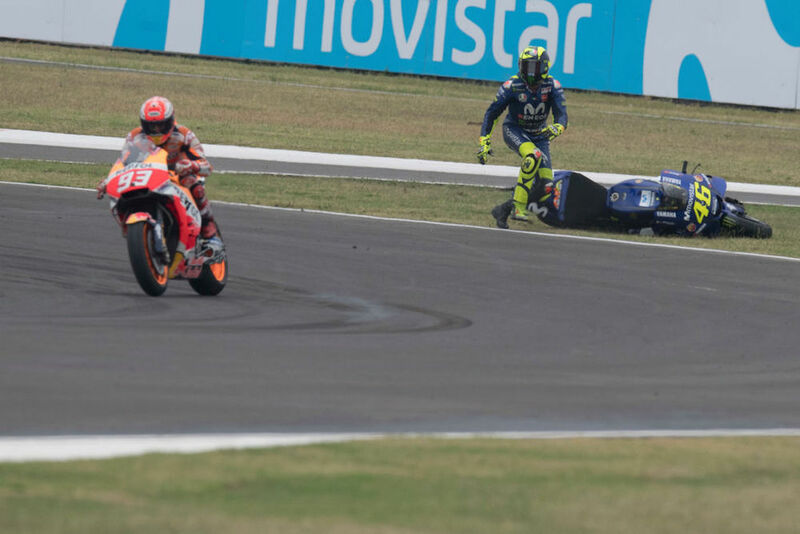 Marc Marquez and Valentino Rossi's rivalry hits all-time high after a collision in the final laps.